Home / Latest News / Clueless About Blogging??? To those who do are as clueless about the blogging world as I am, even the most simple of blogging tools and tricks seem close to impossible. -It is simply a news feed that once someone subscribes to the blog, the “subscribee” gets updates on new post! 2. Now the question was: How in the world will I get the RSS gadget onto the blog!?! -I went to the Blogger dashboard and clicked on designs. Even I, being a rookie to the blog world, know that if I want to make my web page look different designs is the first place I should go. –Blogger’s helpful design layout of the blog, brought me to experiment with add a gadget. Easy enough, I found a gadget that said feed, which was exactly what I was looking for. – Although this may sound like the end of my blogging problems, oh no, you are very wrong. It just brought me to my next head aching question. 3. Someone please tell me what my feed URL is! –Feedburner provided me with what I was looking for…a custom RSS feed. -Next, I inserted my blog’s URL and proceeded with making a Feedburner account. 4. The need to know knowledge- you can’t skip out on this! – Just because you have a Feedburner account and your Blogger up and running the RSS will not magically appear. – Go to publicize, on the side bar you will find Chicklet Chooser. -Go ahead pick your icon. 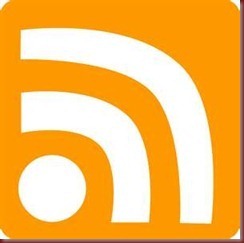 I chose the standard RSS icon, this way my readers could identify it easily.